Rock is a realistic rock generator. The rock can act as a ﬁlter on a clip or layer or you can generate an opaque rock surface. Bump Height determines the height of the bump map used to create the texture of the rock. Bump Detail adds detail to the bump map, similar to adding a gravelly component onto the surface. Decreasing this value creates a smoother surface. Increasing this parameter creates a coarser rock surface. 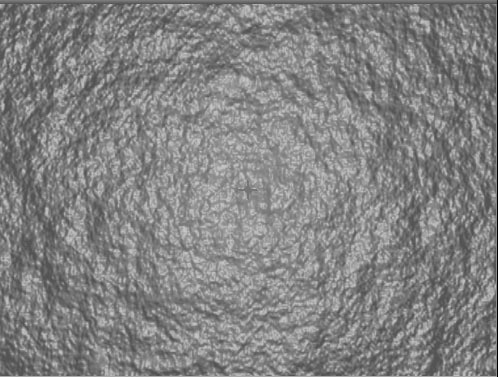 The Offset XY position controls the pattern of the rock at a given point by moving through the procedural noise which generated the effect. Rotation spins the rock bump map around the Z axis. Scale X and Scale Y determine the horizontal and vertical size of the rock. Select the Lock to Scale X checkbox to lock the Scale Y value to the Scale X value, or deselect this option to adjust each parameter independently. Stain Amount sets the amount of stain added to the rock surface. You can use this parameter to imitate dirt, moss, spray paint or water on the rock. At a value of 0, no stain is visible. The Image Layer menu allows you to choose a clip to use as the background of the effect. You can use the ﬁltered layer, or one of the clips below the ﬁltered layer in the timeline.The default setting, None, creates an opaque rock image; clips below the ﬁltered layer in the timeline are not visible. When the Image Layer menu is set to None, the other parameters have no affect. Position XY determines the position of the layer speciﬁed in the Image Layer menu. Select Lock to Scale X checkbox to lock the Scale Y value to the Scale X value, or deselect this option to adjust each parameter independently. Scale X and Scale Y determine the horizontal and vertical scale of the layer speciﬁed in the Image Layer menu. Image Rotation spins the image speciﬁed in the Image Layer menu around the Z axis. Image Opacity sets the opacity of the image speciﬁed in the Image Layer menu.